Morocco's hasty departure from the OAU three decades ago was a protest move, after the organization voted to let disputed Western Sahara become a member. Western Sahara is mostly controlled by Morocco, which absorbed it into the Moroccan kingdom after Spanish colonial forces withdrew in the 1970s. But Morocco's move was controversial, and the international community has never fully accepted it. Meanwhile, the local Polisario Front has considered Western Sahara an independent country since 1976 (formally known as the Sahrawi Arab Democratic Republic, or SADR). Reports suggest Morocco may hope that being part of the AU will help it end the SADR's independence claims. Meanwhile the Polisario government, which represents Western Sahara in the AU, hopes for the opposite, arguing that membership in the organization will limit Morocco's ability to play by its own rules. A total of nine AU member countries, including South Africa, voted against Morocco's readmission. Zimbabwe, Namibia, Mozambique, Botswana, and Algeria were also reportedly among the dissenters. Africans sometimes see Moroccan control of Western Sahara as a kind of continued colonialism, and several of the opposing countries are ones where freedom from European-imposed power systems didn't come easily. A total of 39 countries voted in favor of letting Morocco back in, but with the understanding that Western Sahara would also remain a member. 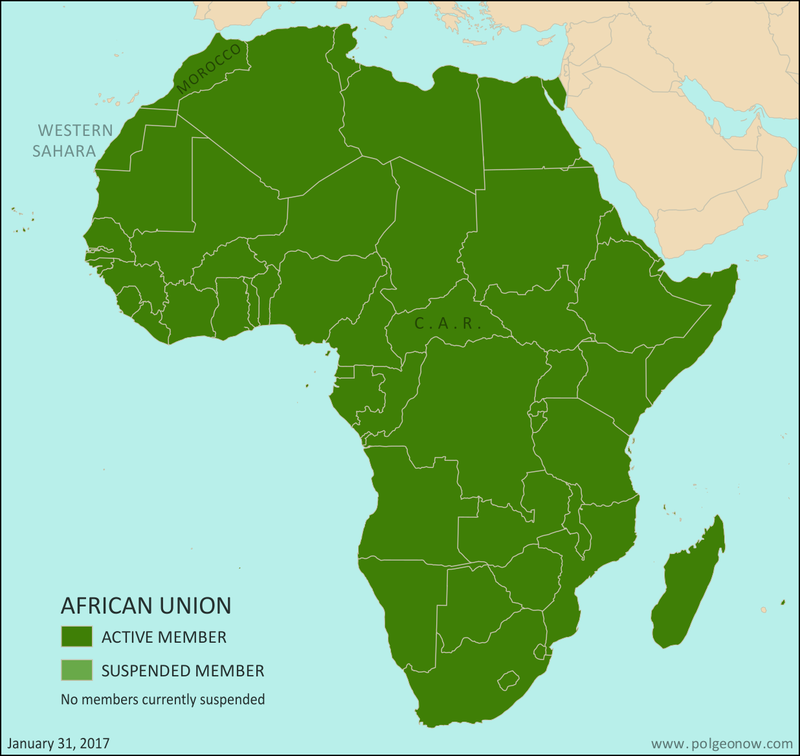 Another change to the African Union map came in April 2016, when the Central African Republic (CAR) was reinstated as an active member of the organization after a three-year suspension. The CAR was suspended in 2013 after a rebel takeover of its capital, followed by the installation of a weak compromise government. Though chaos and violence still continues in the country, the AU cited "the successful completion of the transition process and the restoration of normal constitutional order" when re-activating the country's membership last year, referring to a new presidential election conducted in February. African Union rules don't require countries to be democratic, but any unconstitutional change of government results in a quick suspension. In May of last year, news spread that the Caribbean island country of Haiti was about to join the African Union as a full member. Haiti has close cultural ties to Africa, since most of its population is descended from West Africans brought to the Caribbean as slaves. As the second country in the Americas to win independence, soon after the United States, it's sometimes seen as a symbol of African liberation from colonialism. By last year, the country already had an observer seat at the AU, but would have been the first member country without any territory on the African continent. Only one problem: Despite making its way into major, reputable news outlets, the story turned out to be untrue. Within days, the African Union issued a statement confirming that the reports were false, and that Haiti was not on track to ever become an AU member. The press release clarified that according to the organization's founding rules, "only African States can join the African Union". 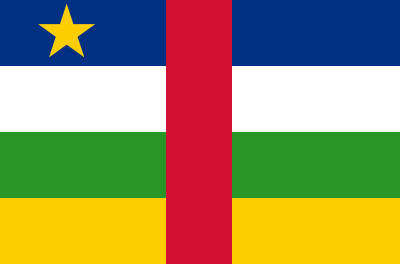 Graphics of the Moroccan flag and the Central African flag are in the public domain.